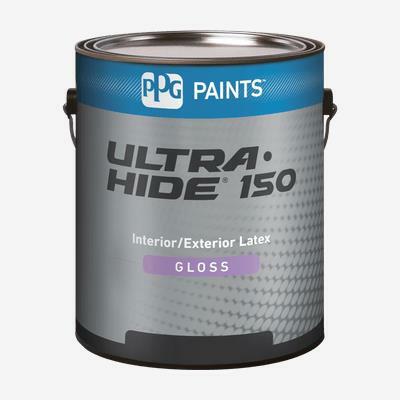 ULTRA-HIDE® 150 Interior/Exterior Latex is specially formulated with exceptional adhesion and moisture resistance properties. This low-VOC, low-odor paint enables a space to be painted while occupied, delivering the durable product performance required. Recommended for use on properly prepared and primed interior or exterior wood, concrete, masonry, plaster, stucco, dry wall, hardboard, steel, galvanized metal, and aluminum. It can also be used on previously painted surfaces and weathered aluminum and vinyl siding. Painting vinyl siding or plastic composites with a darker color may cause them to warp.